Community Change is an online, peer-reviewed, graduate student journal that seeks to explore multiple approaches to democratic community development and change. This interdisciplinary journal examines the practices, processes, and individual and collective struggles that produce change at all levels of society. Community Change adopts a broad definition of community development that includes issues relating to public policy, democratization, collective action, physical and social infrastructure developments, agency, and efficacy. 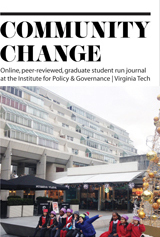 Community Change aims to provide opportunities for graduate students to become acquainted with academic publication processes. Building on issues 1 and 2, Community Change’s third issueseeks to continue unpacking the notion of ‘community change’—its complexities, transformations, and challenges in recent decades of intensified economic, environmental, and political instabilities. It will critically interrogate responses to these processes and investigate where, whether, and how this change is happening. It will also identify the actors within these processes, along with their claims to authority and their motivations. We call for scholarly articles, book reviews, multimedia, and artwork that examine the complexities of community change, probing whether these and related concepts are sufficiently and successfully mobilized to achieve genuine, emancipatory transformation, or whether they serve to reinforce existing structures and relations of power.